No, this isn't a crazy fad diet or weight loss advice. 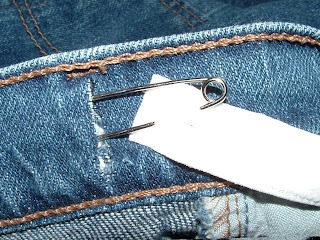 It is a great way to tighten up jeans if they're too big though...and who doesn't love to fix their jeans so they're smaller! I picked up this pair of denim capris at a garage sale a couple months ago. I've worn them off and on, but they're really a size too big and I'm constantly pulling them up. I saw an idea a while ago for putting button-hole elastic into kids pants to make them adjustable. (Sorry can't remember where!) I decided to give it a try with these capris. 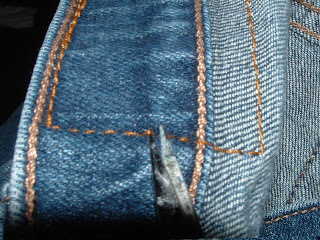 I started by cutting slits in the inside of the waistline to insert the elastic. 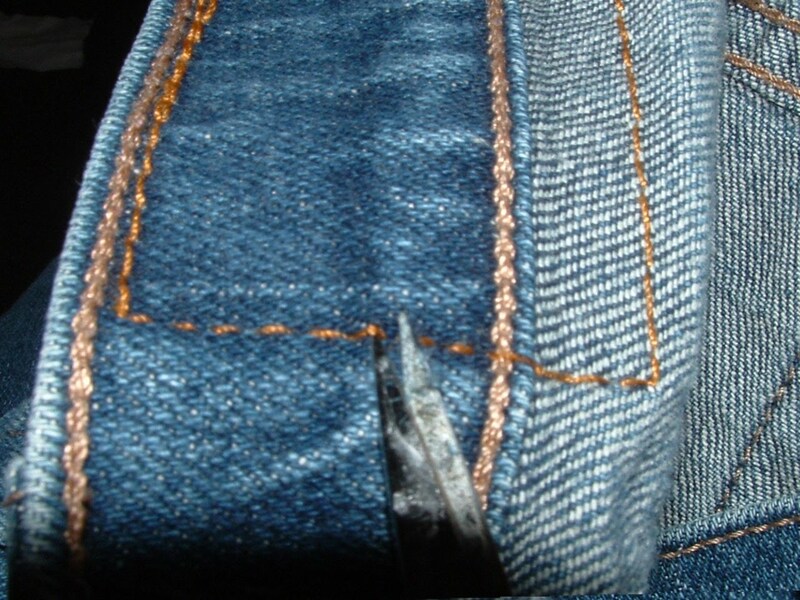 I chose to do it very close to the side seams. 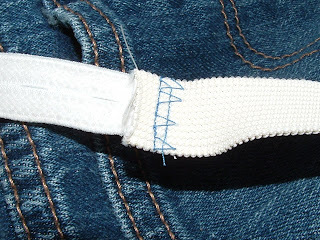 You'll also need to take out any stitching that might go through the waistband and make it so your elastic can't go through. In my case there was a label. I just cut the sides and left it sewn on the top and bottom. The label may come off eventually...but I don't really care. Measure the distance between your two slits and add about an inch. 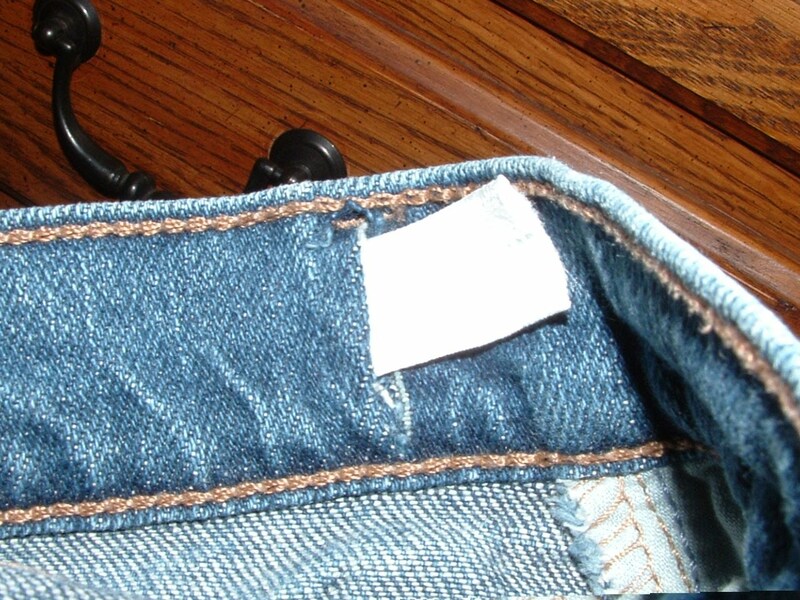 This is the length you'll want to cut your button-hole elastic. 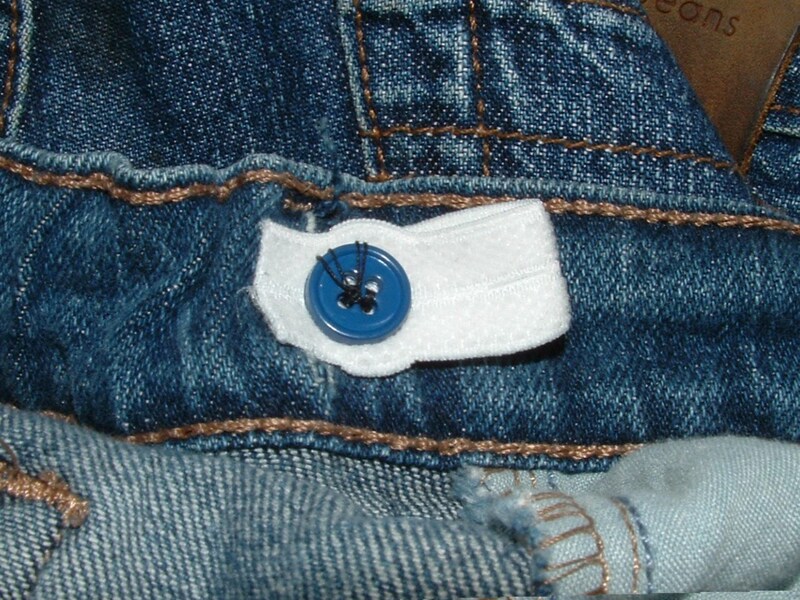 (Execpt I'm too cheap to put want to use button hole elastic for the part that will always be inside the waist of my pants, though, so I sewed button-hole elastic ends onto regular elastic. Once you've got your elastic ready, it's time to pull it through the waistband. I do this by putting a large safety pin on one and and using that to work it through. I had about this much elastic showing after I pulled the elastic through. 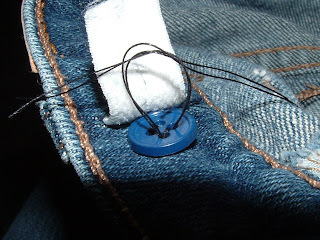 Then I sewed buttons on right next to the slit where the elastic comes out. I tied my initial knot in the button-thread, pretty far in, so there would be a long tail hanging out. Then after I sewed the button on, I was able to tie that tail to the left-over thread to make it secure. 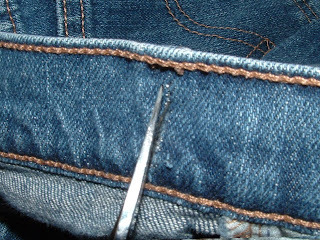 Then I pulled the elastic tighter and hooked it on the button. Then fold the elastic back and hook it again to keep the extra elastic in place. Then I slipped them on, and have been wearing them all evening...and I haven't had to pull them up once. And for Liz at Twelve Crafts Till Christmas, here's a close-up of my first, and so far only, pedicure. All my sisters-in-law and I went out with my mother-in-law for them during the family reunion two weeks ago. And for my own confession to go along with her post...I was once told by someone (not anyone on that outing) that I have ugly feet...and they get uglier in our family every generation. Firecracker escaped those genetics by being adopted. Sweet Pea seems to have inherited better foot genes from the Hubby, so maybe we've broken that cycle. brilliant! I have several jeans to try this on. Wonderful idea. I like that it is not permenant (for fear of going back up in size!) I will have to try this! I have a few pair of maternity pants like this and it has been so so nice. I could wear them tight and as by belly grew I could "let them out". Good idea Polly! I have some pants that could use this treatment. Thanks for the suggestion and instructions. p.s. I'm your newest follower! :) OH and your feet aren't ugly!! How perfect! I bought a couple pairs of capris this summer that stretch out after an hour or two of wearing them then the rest of the day I spend pulling them up over and over. Thanks so much for the tutorial! That's great! Definitely something I'm going to have to try! Interesting. As I am hoping to lose weight and not buy new clothes until I am at a size I am happy with, I am sure I will try this. And I'll also check out your sister's blog. 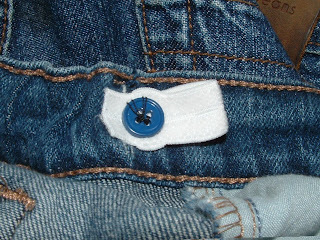 LOVE button hole elastic. Thanks for the Tutorial! I need to do this, since I lost 65 lbs. in the last 11 months! I love that it is not difficult. 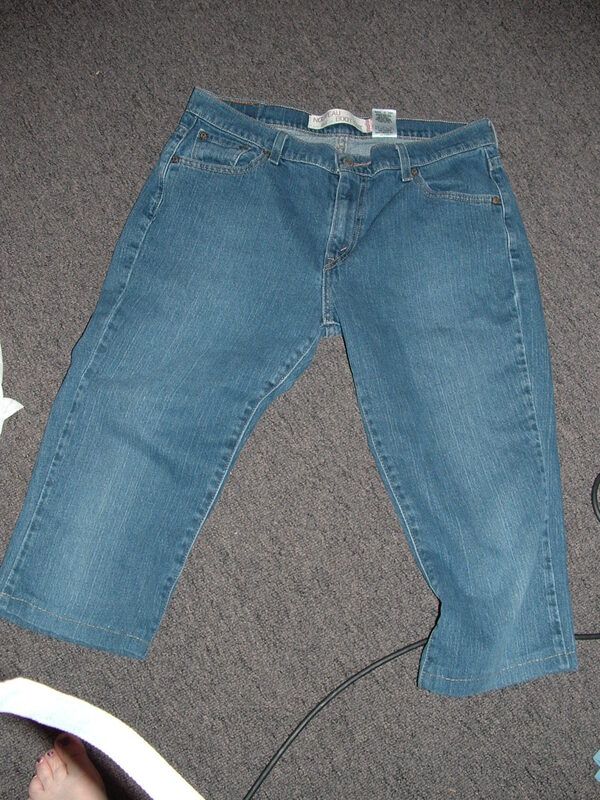 When I altered jeans into a skirt, my mom had to help & manually force her machine to go over some areas!